This weeks game was pretty dismal. Quinn had a terrible game and will probably be third string, he should be. 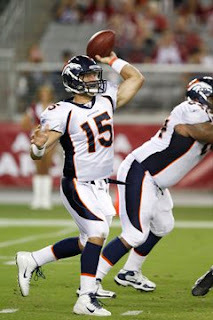 Tebow was good I thought and he had that great touchdown pass. Looked really nice. There was a number of injuries as well to the team. Irving and Davis both got injured but should be OK. The worst injury was to Squid who unluckily blew out his Achilles and will be done for the year. For me I didn't get to see much of the game. I did try to follow along and have an idea of what was going on. The 3rd and 4th spots should be open for running backs. The 3 guys yesterday didn't show much. 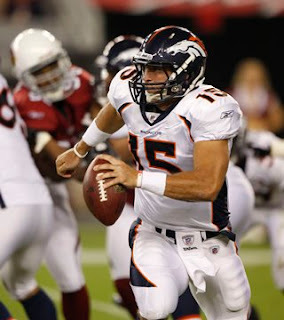 Minor was ok but I think we could get better veterans and wavier wire players then we currently got. For the wide receivers I think it is pretty set. With Davis injured in the game Willis I think is pretty set for the spot. Anderson did not do much and Riley may be pushing for his spot with his play. May be a tough cut here. Tight Ends did nothing so unsure what will happen here. The back up OL should all be gone, lets get better players. I am unsure about the defensive side of the ball, mainly the defensive line. I think Carter and Mohamed had a good game. Carter was probably the best defensive player. Mohamed was good against the run but struggled in coverage. Hunter was ok, so was Beal a bit. Cox struggled in coverage.What little we saw of Irving was good. Chris Harris was solid too. Harris may now have a spot since Squid got injured. Cox looks like he has been saved from the cut too. I am unsure about the safeties though. McBath made one great play but is that enough to save him from the cut? I am unsure. That is all I have from the game. Maybe someone else has other views? ~ Aussie. Are the links up the top screwing up for everyone else? you ready for the draft gouldy. The room is open!!!!!! I'm happy with my FF team. I know I'm a fool for drafting Denver D that high, but how could I be the D is back in Denver without having them? Can I just say.... son of a b****! I can't believe I missed it again! Though I did get injured a head injury at footy, but still crap! Oh well the team looks solid enough. Paid to much Chris. He was a 2nd round pick when they got paid way more than this year's picks and never showed he was significently better than an undrafted McCarthy. Also he couldn't be put on PS. I think EFX waited with him to see if McCarthy cleared waivers or not. We deinatly needed another CB since Cox was cut and Squid injured. McBath may be back with a new contract once no one else wants him. Harris, Unreign and Ramirez are all bubble guys. Unreign will go only if we sign a different DT and Ramirez if we find a better backup C.
G got knocked for a loop. Missed the FF draft again. LOL, to funny. Haha thanks Princess :P I was happy with the Fantasy team. I wanted to draft Johnson in the first round and looks like I did so, the rest seem ok.
Chris our practice squad does look real nice. Bit sad about McBath but he will catch on somewhere, he may even come back like Digger says.